Chef Emeril Lagasse’s Las Vegas restaurants announce the exclusive offering of a W.L. 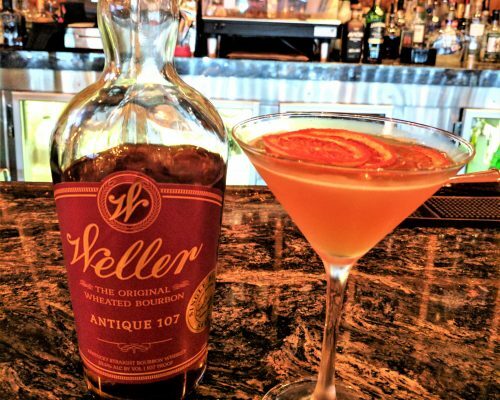 Weller Antique 107 Single Barrel Select wheated bourbon. Limited to 156 one-liter bottles, this unique 107 proof (53.5% ABV) bourbon will be available starting today only at Delmonico Steakhouse at The Venetian and Emeril’s New Orleans Fish House at MGM Grand. The barrel was hand-selected by members of the Emeril’s Las Vegas team. Using the exact recipe as the legendary Pappy van Winkle and distilled and matured at the Buffalo Trace Distillery in Frankfort, Kentucky, this specific barrel #10-L-16-I-7-38-029, was filled on Dec. 16, 2010, aged in Warehouse I, stored on Rick 38 on the seventh floor, aged for six years and five months and bottled at 107 proof. Tasting Notes: On the nose you will find delectable hints of corn cake, vanilla wafer, caramel and custard followed by subtle hints of dried banana. On the palate, a festival of ongoing flavors and complexity with notes of charred corn, oak, cinnamon bark, light white pepper, caramel crumb cake, hints of leather and spice box. Shake all ingredients in a tin with ice. Strain into a cocktail glass and garnish with grapefruit trio. A marriage of a Gold Rush and a Brown Derby, the name represents the idea that most cocktails, even classics, are just one or two variants away from their predecessors. Shake all ingredients in a tin with ice. Strain into a double-rocks glass rimmed with Falernum crystals. Top with ice and expressed lemon neck. The name represents the use of maple syrup in a cocktail that has a dual base of whiskey and cognac; the dual base not being uncommon in a lot of New Orleans classics such as the Vieux Carre. The bourbon will be offered at $14 per 1.5 oz. pour, or $15 for the cocktails. Retail sale is not available.